The home is a sanctuary for your family, and there is nothing more unnerving that realizing that your home has been broken into. According to the FBI, over 2 million burglaries occurred in 2010 – a decrease of 2 percent when compared to the year before – and although crime is a serious concern, our homes and neighborhoods are safer than ever before – much in part to awareness and the preventative steps we are taking. Still, summer into early fall is typically the time of year when homes are susceptible to burglaries. In summer, many families are out of town for vacations. Once school begins, people are in and out of the homes more frequently – for after-school activities and sports or to run a quick errand – and they often get lax in securing their home. Never allow strangers in your home, even if they look hurt or in distress. Make sure your front door has a peep-hole and/or locking storm door. A peep-hole will allow you to see who is at the door before opening it, and a storm door acts as a line of defense. Most contractors, such as HVAC or pool companies, will wear uniforms, show a badge and/or drive a company vehicle. If they are a smaller firm where their employees don’t have those items, they will present you with a business card and notify you ahead of time of what to expect when they show up to your home for the pre-scheduled appointment. When you go for a walk or leave your home for a quick errand, take the time to secure your home. Lock your doors, put your garage door down, and close and lock any sliding doors or windows that can easily be entered. When you leave for vacation, inform a trusted neighbor. Ask them to pick up your mail, paper and other items that can make an unscrupulous person quickly see that you are away. Put your lights on timers so your home looks lived in. Invest in a safe to store valuable items such as jewelry and important documents. You may also want to consider buying one that is flood and fire proof. One of your home’s easiest entry points is the garage. Keep your garage door closed at all times and lock the door that leads from the garage into your home. Don’t leave ladders and tools unsecured outside. These items can be used to gain access to your home. Shrubbery around your first-floor windows can deter a robber from entering your home – especially if they are thorny. If you don’t have any, you may want to plant a few. Neighborhood watch groups help to deter people from targeting your area. Get to know your neighbors and their habits, and ask them to do the same, so you can watch out for each other. Technology can also play an integral role in keeping your home secure. There are several home-monitoring companies in the area, but the one we work with and recommend is LLomar Alarm Company. The advantage to hiring a professional company (and not doing it yourself) because they can monitor your home around the clock. 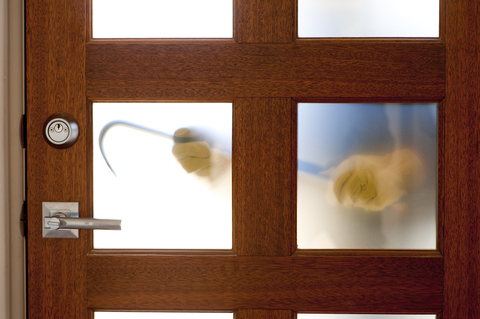 Most break-ins can be avoided when you take some precautions. To get more home and neighborhood safety resources, visit the National Crime Prevention Council’s website. Posted in Home Tips on September 2, 2015 by metzler.